HG Contemporary is a breakthrough gallery founded by Philippe Hoerle-Guggenheim in 2014. The gallery has built a reputation for unearthing distinct artists and producing shows that embrace groundbreaking aesthetics and concepts. The gallery is committed to developing an international contemporary program that is ambitious as well as diverse. The gallery's locations include Chelsea New York, Williamsburg, Napa Valley, and Madrid. This commitment carries with it an innovative and clear vision about producing exceptional art exhibitions as well as a deep understanding of visual culture's function within and beyond the walls of the gallery. HG Contemporary has produced exhibitions featuring RETNA, Tim Bengel, Stuart McAlpine Miller, Conor McCreedy, Jason Dussault, Arsen Savadov, Mehwish Iqbal, Natvar Bhavsar among others. One of the most famous figures in art history, Salvador Dalí, (1904-1989) is remembered as much for his extravagant persona and iconic mustache as he is for his creative output—which spanned painting, sculpture, and product and set design, as well as film. At his death in 1989, Dalí even insisted that he be buried in his own museum, in a lasting demonstration that for the artist, as well as for his audience, the art and the man are inseparable. André Breton in 1929, though the poet would later oust Dalí from the Surrealist movement Dalí’s fascination with sexual neuroses and mortality, along with his strange phobia of grasshoppers, populated his unique brand of Surrealism, which combined an academic style with avant-garde subject matter and laid the groundwork for generations of artists to come. In art as in life, Dalí broke with conventions and forged new artistic languages and methods capable of examining human psychology. His career began at the Madrid Academy, where he was expelled for inciting a student protest against a painting professor who Dalí considered to be a mediocre artist. Driven by a desire to upend the rational and liberate the psyche, Dalí moved to Paris in 1929 to join the Surrealists. That same year, he collaborated with the Spanish director Luis Buñuel to create the first Surrealist film, Un Chien Andalou (1929), an absurdist montage of disconnected images, which included biking nuns, decaying donkey carcuses, and a razor-cut cow eye. Though he shared their artistic mission, Dalí disfavored the Surrealist practice of automatism, a process of spontaneous writing and drawing that was said to unlock the creative unconscious. He prefered deliberate artmaking, leveraging in his paintings the hyperrealistic techniques of the Old Masters to illustrate personal fears and fetishes, such as his dread of impotence and proclivity for the human backside. The photorealists of the 1960s and ’70s, such as Chuck Close and Richard Estes, revered Dalí’s trompe-l’oeil painting style, so much so that he has been called the patron saint of this popular American movement. In the 1930s, Dalí developed the first Surrealist objects, such as his now-iconic lobster telephone, as well as a new practice of image-making, which he named the “paranoiac-critical method.” Pictures of this kind featured optical illusions and double images, which could be interpreted in multiple ways. The most famous example of this technique, Apparition of Face and Fruit Dish on a Beach (1938), features a bowl of pears that double as a woman’s forehead, while the mountainous landscape behind her also resembles a brown-and-white dog. These “paranoiac” paintings challenge audiences to consider how their own viewership can be contradictory and illogical, though Breton dismissed them as mere “crossword puzzles.” While Dalí’s use of abject subject matter, such as the display of sexual acts or bodily fluids, troubled his fellow Surrealists, it was the artist’s unwillingness to denounce Fascism in the mid-1930s that eventually led to his excommunication from the group. Escaping World War II in 1940, Dalí moved to America, cultivating a fame and fortune that earned him the anagrammatic nickname “Avida Dollars.” In his eight years in the States, Dalí designed shop windows for Fifth Avenue, collaborated on set design for ballets, worked on two Hollywood films (Alfred Hitchcock’s Spellbound, 1945, and Walt Disney’s Destino, 1945, released 2003), and authored two books—in addition to his prolific output of painting and sculpture. In America, Dalí capitalized upon mass media culture—appearing in television advertisements, designing magazine covers, and collaborating with the iconic photographer Philippe Halsman which set the stage for Pop artists like Andy Warhol to do the same. 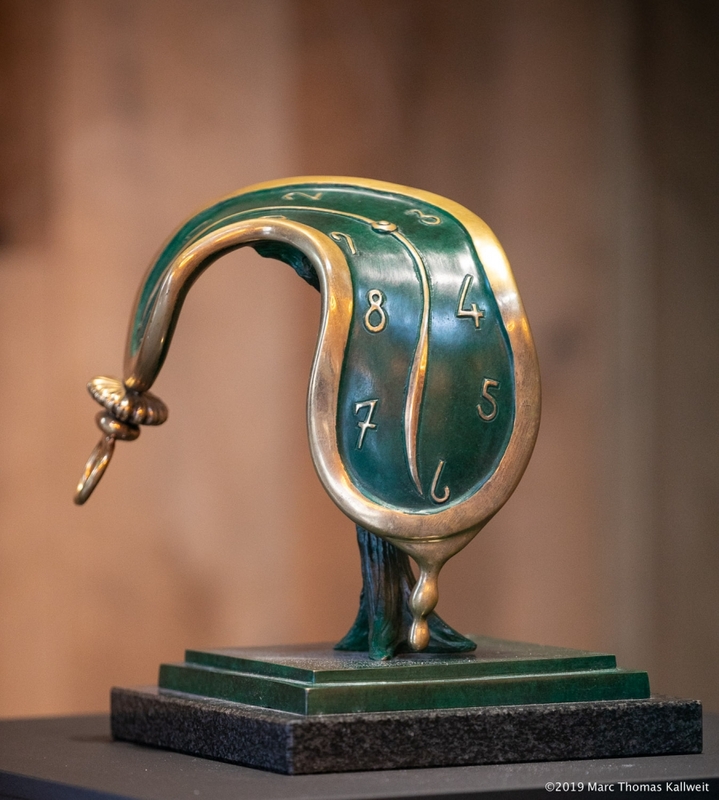 Though some of his contemporaries viewed this venture as low-brow, Dalí became a brand name, one of the first painters to truly achieve global celebrity status. The psychoanalytic theories of Sigmund Freud grounded the artistic pursuits of the Surrealists. Freud’s work was especially important to Dalí, whose family life could not have been more in need of an analyst’s couch. Dalí was named after his older brother Salvador, who had died nine months before his birth. His parents believed that Dalí was his brother’s reincarnation, leaving the artist with the feeling that it was not he, but rather the memory of his older brother who was loved by his parents. When Dalí was a teenager, his mother died from cancer, and four years later his father married his mother’s sister, Tieta. Dalí’s tumultuous family life escalated yet again in 1929, when Dalí titled one of his paintings Sometimes I Spit with Pleasure on the Portrait of my Mother (The Sacred Heart), which so angered Dalí’s father that he expelled the artist from the family. These events underlie some of his darkest and most disturbing paintings, and his personal history would continually surface in his iconography, as objects from his past were later re-imagined as opened drawers, decaying foods, and melting clocks. “The only difference between immortal Greece and the present time,” explained Dalí, “is Sigmund Freud, who discovered that the human body...is today full of secret drawers that only psychoanalysis is capable to open.”Dalí’s Catalan upbringing inspired him throughout his long career. Depictions of his hometown landscape—the Ampurdán Plain—and references to Roman Catholicism recur in his work. The Catalan passion for food may also have contributed to Dalí’s tendency to transform objects into edible or melting forms. “Christ is like cheese, or, to be more precise, like mountains of cheese,” he once explained. Enamored by the legacy of Spanish painting, Dalí filled his private library with volumes on Diego Velázquez, and it is said that he even modeled his signature mustache after him.